CodeIt.Right provides a fast, automated way to ensure that your source code adheres to (your) predefined design and style guidelines as well as best coding practices. We take static code quality analysis to the next level by enabling rule violations to be automatically refactored into conforming code. 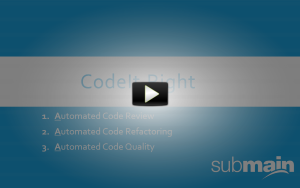 CodeIt.Right helps to improve your software quality, ensure code correctness, find issues early and resolve them quickly. Whether you are starting a new project or maintaining existing product, CodeIt.Right is the right choice! Instant Review allows a select set of rules to run in the background. This provides real-time code issues feedback to developers in the Visual Studio Editor. Code elements that trigger violations are highlighted in the editor and a complete list of file code issues is displayed in the violations bar (located next to the scrollbar at the right). The Violation detail window explains the nature of the issue, offers auto-refactoring options and the option to ignore (exclude) the violation. The feature can be turned on/off with a single click, and supports multiple configurable user profiles that can be switched in the toolbar or the violations bar context menu. Standard Edition (SE) - appropriate for smaller teams. This is the baseline edition from the feature set stand point. Enterprise Edition (EE) - optimized for structured teams of 10+ developers onsite or distributed/virtual as well as enterprises. In addition to the standard features, the Enterprise Edition offers Team/Organization Policy Management, TFS Integration, Enhanced Reporting, Statistics and Trends, plus Code Metrics. Personal Edition (PE) - for solo developers and freelancers who are not part of a team. Includes Standard Edition features as well as Code Metrics. Priced for personal use. See CodeIt.Right Edition Comparison Matrix for details.